Nothing is more discouraging than pouring your time, effort, and heart into a new promotion only to watch it completely flop. If only you could know what the best restaurant promotion ideas are for your specific business without wasting your resources. Well, you can’t see into the future, but you can think objectively before diving into a new promotion. When your restaurant does well, the economy of New Mexico thrives, too. According to the data, millennials aren’t eating out as much as older generations. Obviously, they’re still eating. In fact, when they do eat at restaurants, younger generations spend more money per visit. Here are some promotion ideas to boost your reach with younger folks (and everyone, really). Open or sponsor a pop-up restaurant. Send well-timed email marketing specials. Plant the seed as they’re getting ready to leave work. Host a trivia night based on a specific movie or TV show. Open a food truck (or a few). Participate in food festivals and events. Offer delivery or partner with a delivery service. Highlight seasonal and locally sourced ingredients. Hold a photo contest on social media. Every New Mexico restaurant has a unique budget, menu, and customer base. As a result, you need to work with what you’ve got – don’t fight an uphill battle. 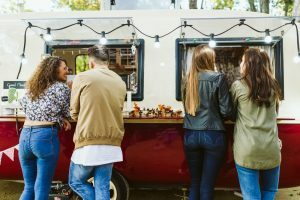 If your budget is limited, pop-ups, food trucks, or off-site events are probably not the best way to spend your money since these are fairly expensive options. Instead, go for something free or nearly free like holding a social media photo contest or trivia night. If you’re somewhere in between, consider expanding your menu to include specialty or seasonal ingredients your customers can’t find anywhere else. Food trucks and festivals are a great way to meet people halfway. Instead of waiting for new customers to come to you, go to them. Consider partnering with food delivery services like GrubHub or even hire your own employees for a personal delivery service. Promote lunch delivery to businesses or customers working remotely. Which Promotions Are Best Suited to Your Products and Service? Fine dining establishments may not be the best businesses for social media photo contests, but they could be well suited for a food truck or pop-up in a business park. Offer a special lunch menu from the food truck that entices workers to visit your restaurant for drinks later that evening. The key is to find a promotion that vibes with your food, service, and customer base. NMRA is here to help all restaurants new and old, big and small. You play a special role in the New Mexico economy, and NMRA is here to help you succeed. Join today or contact NMRA to learn more.